The Roberts ECO4 BT is now discontinued. The Roberts Blutune 5 and Blutune 6 models offer FM, DAB/DAB+ and Bluetooth for a similar price. 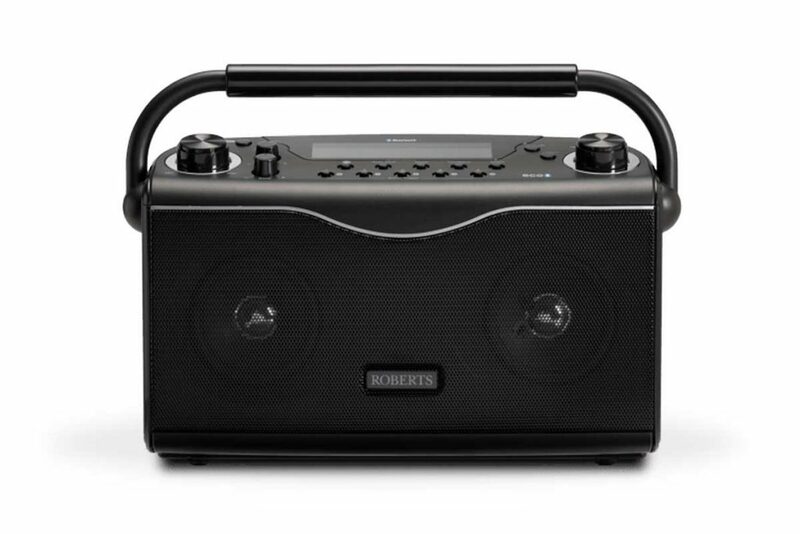 The Roberts ECO4 BT is a versatile digital radio which includes a range of desirable features in a sturdy design. Stereo speakers make the most of the DAB+, FM and Bluetooth inputs. Aux-In is also available for MP3 players and other devices where a wired connection is preferred. Sound can be adjusted with dedicated treble and bass controls on the top of the radio next to the volume knob. The set can be powered with the included power adapter or size D batteries. Roberts say the radio should reach 150 hours of listening time on battery power. This makes it ideal for taking to the greenhouse or on days out. By placing the controls on top of the radio with dedicated knobs and buttons the need to work through menus is avoided. This makes it easier to perform a re-scan (with the Auto Tune button), change from FM to DAB, see different information on the display and select stations with the five preset buttons. A single line backlit display is used to display the station name and scrolling text. The display can also show the time and day, programme type, multiplex name, signal strength and other information by pressing the Info/Menu button. The text is large and clear which some users will prefer to the smaller text on two line displays. Since the first digital radios went on the market there have been a wide range of designs, some taking inspiration from vintage sets. While colourful leather or dark veneers make a statement in living rooms and kitchens you might not want to carry them about too much or use them in a less pristine environment. The design and materials of the ECO4 BT remind us of the Roberts Gemini 3 from the early 2000’s. A black metal speaker grille takes up the front of the radio with the display and controls occupying the top of the radio. A large volume knob is situated on the left with a control knob on the right, both surrounded by chrome. Moving the radio around the home or taking on days out is made easier with the durable carry handle. The Roberts ECO4 BT weighs 1.9 kilograms. Verdict: The ECO4 BT makes good use of the stereo speakers and audio controls with DAB/DAB+ and FM. Use a smartphone or tablet with the built-in Bluetooth or Aux-In for internet radio or Spotify. It's hard to think of anything missing from this radio.